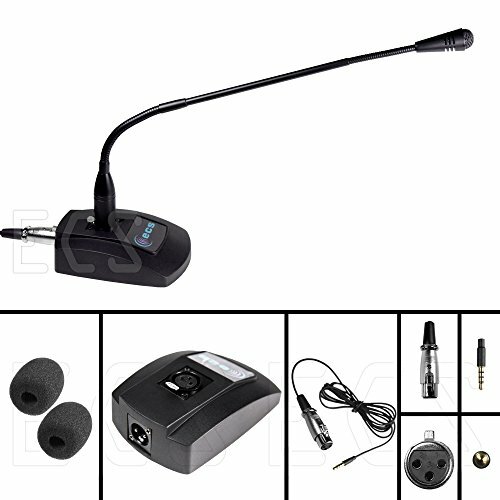 ECS WordSentry 4-pole Gooseneck Microphone for iPhone, Android Smartphone, Microsoft Surface and other tablets with 4-pole, laptop which has only one 3.5 mm audio female jack (input/output). The ECS-WSGM3.5-4P is designed especially for hands free recording. The ECS-WSGM3.5-4P conference microphone has a built-in state of the art microphone element eliminating interference caused by on-board chip sets that are often placed close to noisy electrical circuitry and can negatively affect speech recognition or dictation results. The integration of windscreen filtered audio technology makes this by far our highest quality 3.5 mm hands free gooseneck microphone to date. Anti-slip Rubber pad ensures base remains firmly on desk. NOTE: Only compatible with 4-POLE TRRS 3.5 mm jacks on computers, tablets, android, iPhone's and other smartphones. The ECS-WSGM3.5-4P is designed especially for hands free recording or any other application listed: Facetime talking, Internet Chat, Podcasting, SKYPE, Webinar, YouTube Recording.